Romano’s Italian Soda has an updated sugar profile. The product is sweetened with C&H pure cane sugar. Product labels are updated to communicate this exciting change in sugar to our consumers. The diet formulas will continue to use Splenda®. Both regular and diet flavors now reflect the Italian flag on the front of the label in addition to the small Italian flag graphic on the back of the label. Romano’s Italian Soda is available in seven flavors including Creamy Strawberry, Orange Cream, Sour Apple, Vanilla Cream, Yumberry Blue, White Peach, and Sugar Free Orange Cream. Diet Romano’s Italian Soda is sweetened with sucralose (Splenda® brand) and is available in Orange Cream. Currently, Romano’s Italian Soda and Diet Romano’s Italian Soda is available in bottles and at the soda fountains in convenience stores, restaurants and cafes. The product has experienced steady growth over the past few years; Orange Cream is the best selling flavor. Romano’s Italian Soda Company continues to expand its distribution within Oregon and surrounding states. Romano’s Italian Soda Company is dedicated to recreating delicious Italian sodas so everyone can enjoy them. With Romano’s there is no inconsistency. 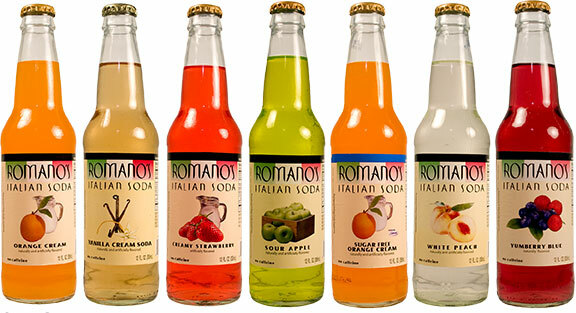 Romano’s Italian Sodas offer consumers the refreshing, flavors of Italy right here in the Northwest. based company and bottled in the Northwest. Get in touch with Us.